Located at the intersection of Eustis and Washington Streets in Roxbury. Whom have we lost STOUGHTON! Alas! I have said sufficient, Tears press,I keep silence. On the Seventh of July, in the Year of Safety I701, He died. Indeed, history remembers all too well “What Grief” he brought to those accused in 1692. Robert Calef, author of More Wonders of the Invisible World, is buried here beneath a small gravestone (Plate 37) carved by a member of the Foster family of Dorchester. 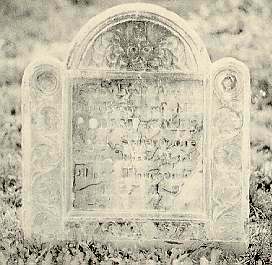 The inscription reads: “Here lyes Buried the Body of Mr. Robert Calef Aged Seventy one years Died April The Thirteenth 1719.” Calef wrote his More Wonders, he tells us, as a rebuke to those who still believed in the methods used in the 1692 witch hunt. He feared the witch hunt “should be Acted over again inforced by their Example, rather than that it should Remain as a Warning to Posterity.” It is widely believed that Calef received much of his material for the book from Thomas Brattle. The book’s attacks on Reverend Cotton Mather were so harsh that no Boston printer would accept it, so Calef was forced to send it to England for publication. Calef himself was a cloth merchant and served Roxbury as a selectman until his death.